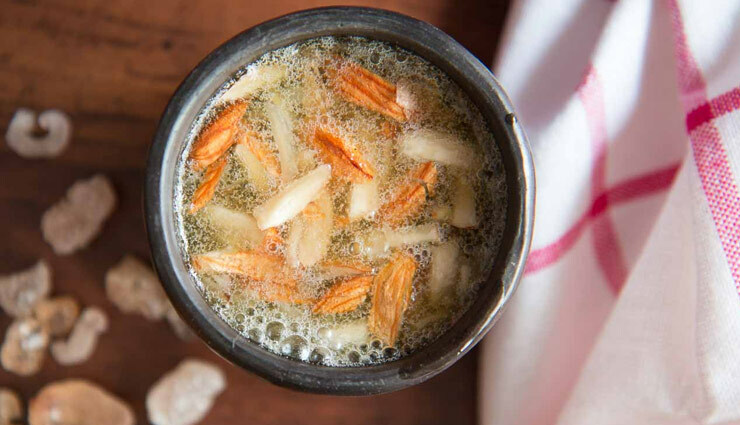 Goondh Paani Recipe (Sweet Gum Tree Almond Drink Recipe) is a traditional drink made from gondh or gum tree relished with almonds and jaggery. * We begin making the Goondh Paani Recipe ( Sweet Gum Tree Almond Drink Recipe) by heating ghee in a Flat nonstick pan and frying the gum tree for about 10 minutes. * Fry until the gum tree becomes opaque and increases in size. * Then later slowly add 1 cup water along with jaggery and keep mixing until the Gumtree slowly dissolves in water. * Once water thickens add the sliced almonds and give it a stir. * Your Gondh Paani (Sweet Gum Tree Almond Drink) is ready to be served hot.